The death of American newspapers is now occurring at an almost predictable pace. Every day it seems we hear about another major newspaper closing its doors or declaring bankruptcy. Today it was Denver’s venerable Rocky Mountain News. The phenomenon has become so epidemic there is even a website called Newspaper Death Watch, which, as its tag line says is “chronicling the decline of newspapers and the rebirth of journalism.” Even in my own home town of Seattle, we will almost certainly lose one of our major dailies, and many predict both within a year or so. Are we witnessing the end of American journalism and news reporting? Newspapers are experimenting with user generated content. The study found that 58 percent of newspapers allowed for user generated photos, while 18 percent accepted video and 15 percent articles. 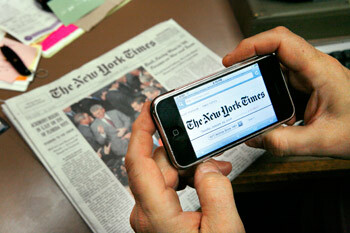 Overall, 58 percent of newspapers offered some form of user generated content in 2008 compared to 24 percent in 2007. Research shows that the number of newspaper websites allowing users to comment on articles has more than doubled in the last year. Seventy five percent of newspapers now accept article comments in some form, compared to 33 percent in 2007. Ten percent of newspapers had social networking tools, such as user profiles and the ability to “friend” other users, built into their sites in 2008. This compares to five percent of sites that included this feature in 2007. It is surprising that this number isn’t higher. Seventy six percent of newspapers offered a Most Popular view of content in some form (Most Emailed, Most Blogged, Most Commented, etc.). This compares to 51 percent in 2007 and 33 percent in 2006. Integration with external social bookmarking sites like Digg and del.icio.us has increased dramatically the last few years. Ninety-two percent of newspapers now include this option compared to only seven percent in 2006. Though its format may change, journalism, I am confident, won’t disappear. According to Technorati, many of the largest media properties (by audience size) in the US are now blogs. The blogosphere, as a medium, is beginning to mature as it grows, and as it gains influence, will no doubt adopt the habits, practices and editorial checks and balances that evolved in newspapers over time. 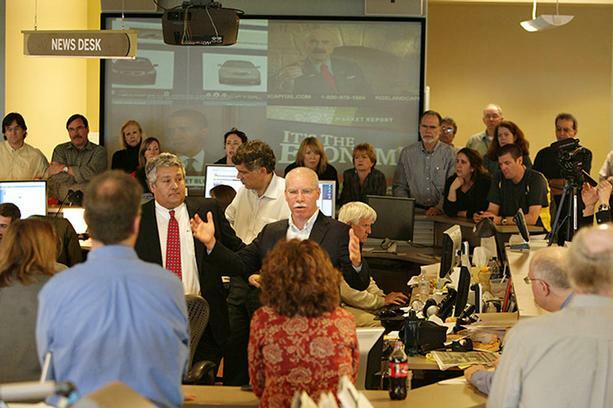 Many blogs, like the Huffinton Post, have evolved into very successful online newspapers. The “HuffPo” completed a $15 million financing in November, 2008 which will allow it to do more investigative reporting, as well news commentary. It’s low overhead and large audience, built in just over 3 years, may reveal why news-blogs are the new newspaper. The news-blog will, by its nature, be a dialog with its readers – a co-creation of journalists / bloggers and their readers. Every aspect of the news-blog will be measurable and “tweak-able” which will be good for improving the product and attracting advertisers who will foot the costs. Just as the birth of modern newspapers took journalism to new heights, so too will the birth of the news-blog. This entry was posted in Journalism & Newspapers, open publishing, publishing strategy, readership strategies and tagged 2008 Bivings Report, Huffington Post, news-blog, Newspaper Death Watch, Rocky Mountain News. Bookmark the permalink.